Rupert Murdoch fights to retain control of his media empire, News Corp.
London (CNN) -- Damaging allegations over phone hacking are continuing to mount against Rupert Murdoch's media empire. British journalists working for Murdoch's News of the World (NoW) stand accused of hiring private detectives to hack illegally into the voice mails of thousands of people, ranging from top politicians and celebrities to murder victims and the families of troops killed in action. There are also allegations that journalists bribed police to get private details about people, including members of the royal family. The scandal has exploded in recent months, prompting the closure of News of the World, forcing Britain's top policeman to resign, threatening Murdoch's control of his News Corp. global empire, and raising serious questions about Prime Minister David Cameron's judgment. London's Metropolitan Police -- also known as Scotland Yard -- are running two investigations, one into the phone-hacking allegations and one into the charges of bribery. Separately, Cameron has announced a public inquiry into the ethics and methods of the British press. Murdoch and his son James, who is head of News Corp's European operations, appeared in July before a parliamentary committee that is also examining the scandal. How were the phones hacked? Phone hacking involves calling a phone from two other phones at the same time, sending one caller to voice mail. That caller then enters the code number to retrieve voice mail remotely. Hackers depend on the fact that many people never change the default PIN for voice mail retrieval. Has anyone been convicted in the scandal? NoW royal correspondent Clive Goodman and private investigator Glenn Mulcaire pleaded guilty to intercepting telephone messages in 2007 and went to prison for it. When police arrested Mulcaire, they seized 11,000 pages of documents with the names of 3,870 potential victims of illegal eavesdropping. The files apparently cover several years of activity up to when Mulcaire was arrested in 2006. Why did the scandal erupt again? Despite the convictions many believed there was more to be revealed. Two newspapers, the New York Times and the Guardian, kept the story in the public eye, depsite News International's insistence the practice was not widespread. Many politicians and celebrities also demanded to know if their names were in Mulcaire's files. Some sued News International, which published the News of the World. The pressure prompted the Met to open a new investigation in January, and officials began going through Mulcaire's files and notifying people whose names are in them. On July 4, the family of a murdered teenage girl, Milly Dowler, were shocked to discovered that her phone had been hacked when she was missing in 2002. They said the hackers had deleted messages from her voice mail to make space for more, giving them hope she was still alive when she was already dead. Public and political outrage in Britain was immediate and intense, and it only got worse over the next two days as it emerged that victims of a terror bombing and the families of British troops who had died in action had also been possible targets. Less than a week after the Milly Dowler accusation, the Murdoch family announced it was closing NoW. Why is James Murdoch under renewed pressure? Until this year News International had maintained hacking was confined to one private investigator and one "rogue reporter." But the parliamentary investigation is trying to establish how widespread the practice was. 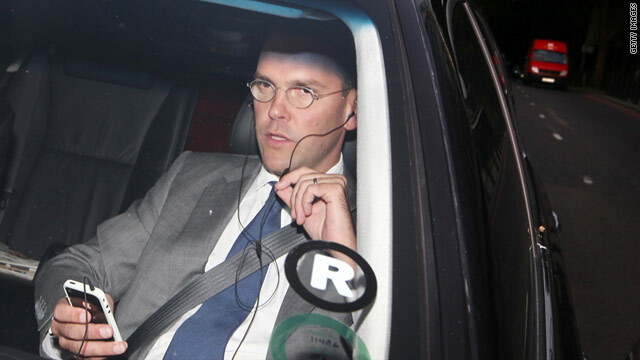 In evidence to the committee James Murdoch said he could not recall seeing a document, known as the "for Neville" e-mail, so named for its apparent connection to NoW chief reporter Neville Thurlbeck. This email is central to the issue because it implied that phone-hacking was being conducted by other News of the World journalists as well as Goodman. The paper's then-editor Colin Myler and its former head of legal affairs Tom Crone later said they told James Murdoch about the e-mail. The document is thought to have played a key role in the decision by executives at News International to agree to an out-of-court £700,000 ($1.2 million) settlement with English soccer executive Gordon Taylor. James Murdoch admitted in testimony to the parliamentary committee that the payout was for "illegal voice mail interception." The parliamentary committee also published a letter revealing that while fighting his dismissal from the paper, Goodman alleged that "other members of staff were carrying out the same illegal procedures." He also wrote that "explicit reference" to phone hacking was "banned." The copy of the letter, published by lawmakers investigating the scandal, blacks out the name of the person who banned it. This letter -- together with claims made by Myler and Crone -- undermines James Murdoch's argument that he was unaware that illegal phone hacking was going on. John Whittingdale, who chairs the committee, said he anticipated James Murdoch, as chairman of News International, would have more questions to answer on the phone-hacking issue. Why was the closure of News of the World significant? Closing News of the World was a seismic event in British journalism -- it was the best-selling English-language newspaper in the world, shifting something on the order of 2.5 million copies every week. And the 168-year-old paper could prove to be the canary in a coal mine of Rupert Murdoch's global media empire. Analysts are questioning whether the scandal will lead to the Murdoch family losing control of News Corp., bringing down one of the most powerful media barons the world has ever seen. Is this important outside of the United Kingdom? Yes. American authorities are probing two separate lines of inquiry -- one into whether Murdoch journalists hacked the phones of September 11, 2001, victims, and one into whether the company broke U.S. law by bribing foreign officials. The Federal Bureau of Investigation is looking into the 9/11 claim, first floated by the Daily Mirror newspaper, a competitor to Murdoch's Sun in Britain. The Justice Department, meanwhile, is coming under pressure from American lawmakers to probe whether the company violated the Foreign Corrupt Practices Act by paying British police officers for information. Australia -- where Murdoch was born and still owns newspapers -- is also concerned about the issue. Murdoch's company encompasses Fox News, 20th Century Fox film studios, the Wall Street Journal, the New York Post and Harper Collins publishers. It also controls satellite broadcasters including BSkyB in Britain, plus Sky channels in Italy and Germany, and newspapers including the Sun and the Times. Rebekah Brooks was editor of News of the World when the alleged hacking of Milly Dowler's phone took place. She went on to become chief executive of the company that published the paper, News International. A close confidant of the Murdoch family, she became the focus of much public and political anger when the scandal caught fire. Rupert Murdoch first insisted his top priority was to protect her, but he accepted her resignation 11 days after the Dowler allegations were first made. She was arrested two days later, questioned for nine hours, and released on bail. Her lawyer insisted the following day that she was not guilty of any crime and that police had not charged her. How does this affect Prime Minister David Cameron? Coulson always insisted he did not know about Goodman and Mulcaire's crimes before they pleaded guilty, but quit because he was in charge when they happened. He worked for Cameron until the police launched their new phone-hacking investigation in January, then resigned, still professing his innocence, but saying he had become a distraction for the prime minister. Critics have slammed Cameron's judgment in hiring Coulson since public outrage took off, but the prime minister has repeatedly insisted that he felt Coulson deserved "a second chance." Why did Britain's top policeman resign? Not just one but two of the top officers at the Metropolitan Police have quit amid accusations that the police were at the very least too cozy with the press and at worst corrupt by accepting payments from News International. Paul Stephenson, the head of the Met, resigned after it was revealed that Scotland Yard had hired a former top News of the World journalist to be a communications consultant. The revelation came the day police arrested the journalist, Neil Wallis, over the phone-hacking investigation. Stephenson insisted he had done nothing wrong, and unleashed a blistering attack on Cameron when he quit, saying: "Unlike Mr. Coulson, Mr. Wallis had not resigned from News of the World or, to the best of my knowledge been in any way associated with the original phone hacking investigation." The day after Stephenson quit, Assistant Commissioner John Yates handed in his resignation. He was the one who decided in 2009 that there was no need to open a new police investigation into phone hacking despite the 11,000 pages of evidence sitting at Scotland Yard -- a decision he later admitted to Parliament was "crap." CNN's Richard Allen Greene contributed to this report.